Epson isn’t done with their new projector releases just yet, having rolled out the Epson MovieMate 60 home theater projector which is touted to be the lightest, brightest and most versatile offering that fall under Epson’s innovative line of “all-in-one” home theater projectors. 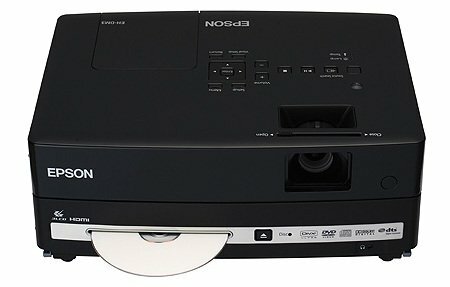 It will merge the functions of a wide range of devices, including a high-quality, high-brightness projector, a CD/DVD player (no Blu-ray here, but at least it will help keep the final cost down), a microphone input for those crazy big-screen karaoke sessions and stereo speakers in a single, portable unit. Talk about having an affordable, easy-to-use and versatile solution for home entertainment that can be used in just about any room, and even carried with you and your family on your vacations. If you’re interested in bringing home the Epson MovieMate 60 with you for your family to enjoy a big screen experience from this year onwards without breaking the bank, you’ll be pleased to know that the device will be available from next month onwards via a variety of channels including national resellers, where it is going for an estimated street price of $699.